Shortlisted for Best Documentary (you'll know if it was nominated by the time you read this). 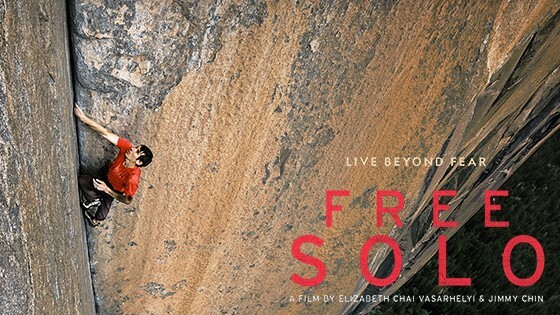 "Free soloing" is the process of climbing a cliff without any rope. For most people, they'd rather experience the process secondhand, so don't try this at home, or in any national parks. One person who does that sort of thing firsthand is Alex Honnold, whose dream was to climb the 3,000 cliff El Capitan in Yosemite National Park. A film crew tags along - with far more safety precautions - giving us views we will never, if we're lucky, see firsthand. What we can do, though, is use Honnold as inspiration for goals in our own lives. Things on flat ground. Like getting the dishes done or weeding. Or just going to the movies and eating popcorn in comfy chairs while we watch someone else achieve his dream.